What is Shutter Speed? - Shutter speed is the amount of time that your camera shutter is open for (TV Time Value). The longer the amount of time your shutter is open for the brighter the exposure will become and the shorter the amount of time the darker. We are controlling how long the sensor is exposed to light. When we change the shutter speed we are affecting ANY available light source in the scene but not flash. Just like with ISO we can change the shutter speed in 1/3rd stops or full stops. The table below shows 1/3rd stop and Full stop shutter speed values. Please note that your camera may not have an option to go to 1/8000th sec, some cameras can only get to 1/4000th which is 1 stop slower than 1/8000th sec. * Take the time to learn these values.. get to know them. As we slow down the shutter speed we will increase exposure but we have a few other things to consider also. Camera shake & subject movement.. this is assuming we want a sharp photograph and sharp subject. If we shoot with too slow a shutter speed we risk picking up the small movements of the camera that can happen (especially with longer lenses) and we also risk the subject being blurry if they move as well. It is also a good rule of thumb to maintain a shutter speed of at least 1 / Focal Length... basically equal to your focal length or faster to help keep the dreaded camera shake away. That all said sometimes you have to break those rules. In this photograph above I had to break the (1/Focal Length) rule and shoot at 1/50th sec with an 85mm lens. I know my camera / lens and I know I can hand hold slower... I hoped that the subjects did not move too fast. Sometimes you have to push the technical limits & rules a little. If we change things up and go to a faster shutter speed we then start to reduce the exposure (1/3rd, 2/3rd, 1 Full Stop). We can also use a faster shutter speed to help freeze movement and stop action.. assuming we have enough light. HINT - ISO can help here. 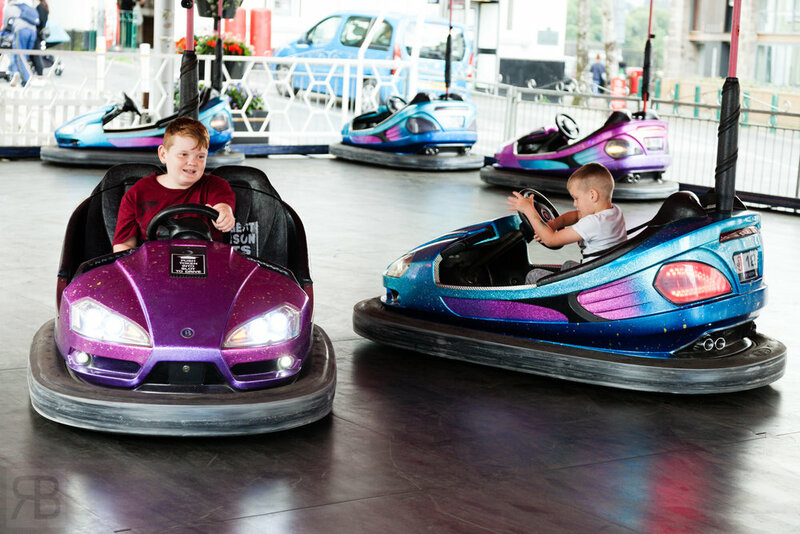 My god sons on the bumper cars. 5D Mark II + 24-105 F4 L lens. ISO 1250 F5 1/250th sec. Available light. Let's take a visual look at shutter speed affecting exposure in the video below. Earlier in this post I mentioned that shutter speed does not control flash exposure and in the video I mention that it has a relationship with flash via a thing called sync speed, both are true. Shutter speed will only affect available constant light sources. Wait What's Sync Speed ? Basically the sync speed is the fastest shutter speed that a given camera can synchronise with flash and it varies camera to camera. THE only reason I am mentioning it now is to make you aware of it, but don't worry about that now because you need to learn the fundamentals first. We will get to flash much later on this blog. Remember as you slow that shutter speed down you increase exposure by 1/3rd, 2/3rd's, 1 Full stop. Each stop is 3 clicks of that dial. The opposite happens when you increase your shutter speed, you decrease exposure. You will find yourself in situations where you need to go to a slower shutter speed and a higher ISO along with a nice wide open aperture to get a good exposure. All of this will become clear as we move through these tutorials. Next up is aperture and the affect is has on exposure.